The Importance of Making Mistakes! Huh? I know this could be the reaction of some of you that read the title of this article. 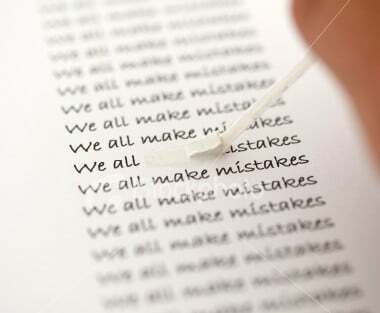 They could also question, what is important about making mistakes? I usually try to avoid making them. Like many of you. But, I am going to explain the vital role that mistakes play in our lives. Think about it, whenever we make a mistake there is a repercussion (cause and effect). Therefore, this make us think twice about our behavior or actions, especially when the mistakes bring us great pain or guilt. A great and simple example of this is when a child is jumping on top of the bed. When his mother sees him jumping up down she tells him to stop it. The child so involved in the moment disregards his mom’s warning or direction. However, if he falls hitting him self real hard then he may learn the lesson, which in this occasion is not jumping on the bed. Of course, not all lessons are that easy to learn and it may take for us to trip over the same rock more than once in order to learn the lesson. Since at times we are just not aware or distracted with other issues in life. But, don’t get discourage, if you make a wrong turn or even many of them. You can always change things for the best. Do not see your mistakes as failures. Instead, learn to think of them as learning experiences. It is exactly what they are (hands on experience). So, the next time you are on a similar path you can make a wiser choice. When things do not go your way, simply slow down and contemplate on what went wrong? What you disliked the most about the whole experience? How you can avoid making the same mistakes again? Then once you formulate your plan, implement it in your life. In absence of accurate way to track medical errors, TEDMED panel ponders what’s to be done?